If you're preparing to get quotes for solar power, this guide provides valuable information on the star component of a system installation – the solar panels. Before we delve into the wonderful world of PV modules and which are the best solar panels to choose – we need to make sure we are talking about the right panels. So let's get any confusion out of the way. This site is dedicated to photovoltaic solar panels; also known as "solar PV" or "solar electricity" modules. 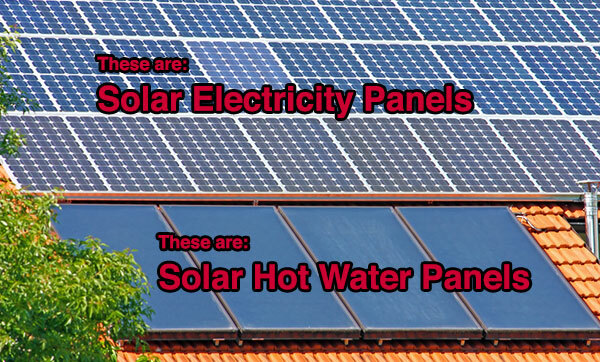 There is another type of solar panel that is used for heating up your water (as opposed to generating electricity). This type is called a "solar hot water panel" or "solar thermal collector" and is a completely different beast. If after watching the video you have decided that solar hot water is your thing, then you probably want to be at my other website, which is 100% dedicated to solar hot water systems. So now we've established that, let's jump in! Solar panels are the most critical part of any solar power system. So choosing the best brand and type for your requirements is just as important as making sure they are installed by a competent accredited installer at the best angle and pointing in the optimal direction. Unfortunately, most solar salespeople aren't going to be a whole lot of help when it comes to choosing the best solar panel brand! Why? Because, despite my best efforts to persuade them otherwise, most of them will use the sales strategy of insisting that their solar panels are the best quality and everyone else is selling crap modules. When shopping around to get the best from your solar panel rebate, one of the points that will set different installers apart is the type and brand of PV module they offer you. When I talk about efficiency, I am referring to the ratio (as a percentage) of the energy in the sunlight that hits the panel surface to the electrical energy generated by the module. For example, if the solar panel captured half the energy in the sunlight, then the module's efficiency would be 50%. In real-world conditions, conventional panel efficiencies range from about 12% up to just over 21%. Why is a high efficiency good? Well, the higher the efficiency, the more watts of electricity you will get per square meter of panel. So, the higher the efficiency – the smaller that solar panel becomes for the same electrical output and the less roof space required. This disadvantage of high efficiency panels is that they tend to cost more. So if roof space is at a premium, or you just want super-duper PV technology, look into higher efficiency modules. Otherwise, as long as the panel efficiency is over 15%, don't worry about it. When weighing up how much solar panels cost, the obvious calculation you need to make is: How many watts of electricity are you getting per dollar of module, or alternatively, dollars per watt? Decent solar panels, not including other system components or installation, can range in price from 67c to $1.60 a watt; inclusive of GST. As a general rule and like most things in life, you do tend to get what you pay for – so be cautious about choosing solar panels solely on price as a low cost could translate to poor performance and reliability. However, there are often bargains on quality products to be had, special deals and some suppliers are just more competitive. Just make sure that you are comparing apples to apples in terms of warranty, service, product quality and so on. It is not easy to determine the quality of solar PV panels, inverters and installation service from a quote – and as mentioned, salespeople tend to be biased. The first thing I would do to rate a panel brand is to look at the solar panel reviews that I have collected from Australian customers over the last 9 years; so you'll get a good idea of how various modules perform in local conditions. These reviews are only from Australians who have had the panels installed for at least 12 months. The next thing to realise is warranty statements and conformance to quality standards give a pretty good indication of a solar panel's quality. Pay particular attention to the fine print concerning issues such as where you might have to send your modules if there is a problem, whether they are fully standards-compliant and approved for use in Australia, plus the experience of the company supplying you. Will they be around in 10 or 20 years if something goes wrong? As an absolute minimum, insist on at least 10 year manufacturers warranty (also called product warranty) on the modules. Be aware that this is a different guarantee to the 25 or 30 year "performance guarantee" that every solar panel out there carries. Without getting into details, the performance guarantee is almost worthless because it is so easy to wriggle out of. The manufacturer's guarantee is the one that you need to look at and it needs to be at least 10 years. This blog post covers solar panel warranties in detail. Finally, make sure the warranty isn't tied to an expensive service contract every year or two. You don't want to be compelled to shell out $500 a year for a bloke to hose down your panels just to keep your warranty! By the way, this sort of warranty stipulation is likely unenforceable under Australian consumer law! Some people insist the best solar panels are made in Germany and all Chinese solar panels are crap. Follow that previous link for a deeper discussion on this, but frankly I find that talk borderline racist. You may have reasons for not buying Chinese products and I'm not going to get into a debate on it. However, as far as quality is concerned, some Chinese brands are just fine, great even. Some are crap, but if you think "Chinese" is synonymous with "low quality", what do you think about your iPad or your Macbook Pro? Yep, made in China…and they're both pretty high-quality, sophisticated devices. The power tolerance (i.e. are you getting 250W or 250W +/-10%?) Some are much better than others. The voltage rating and coefficient of temperature. Panels should be rated to 100V DC minimum for safety. A good temperature coefficient rating can indicate a solar panel that performs slightly better in higher temperatures. Who is the original manufacturer? Some companies buy in panels and self brand them. Who is the real manufacturer and how will they support you? Some people prefer the look of certain types panels to others. As a general rule, thin film panels look more uniform and some feel these look best, although they take up much more space due to their lower conversion efficiencies. Some suppliers can integrate the panels into your roof, others can supply solar roof tiles. And if you've got a whacky, curved roof, you can even get flexible solar panels these days! However the sleek aesthetics of integrated solar power comes at a price of course. As a general rule, choosing a more "utilitarian" look will be cheaper and super slick integrated systems can cost considerable more. Next up I'll go through the different types of solar panel technology available. If you would like a simple answer to the question "How Do Solar Panels Work?" before we get into the different technologies, then that link should satisfy your inner geek. 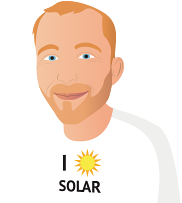 Otherwise let's move on – or if you're ready to get pricing on a system, you can get up to 3 solar quotes via my free service from Australian installers I have personally pre-vetted and trust.